Maybe you’re not as obsessed about your gear as Andre, but we all need goals, right? Let’s take a look at some of the best bags on the market, so that you can begin your road to obsession. Our first bag is designed for another pro that is in control of every element of his game – Roger Federer. 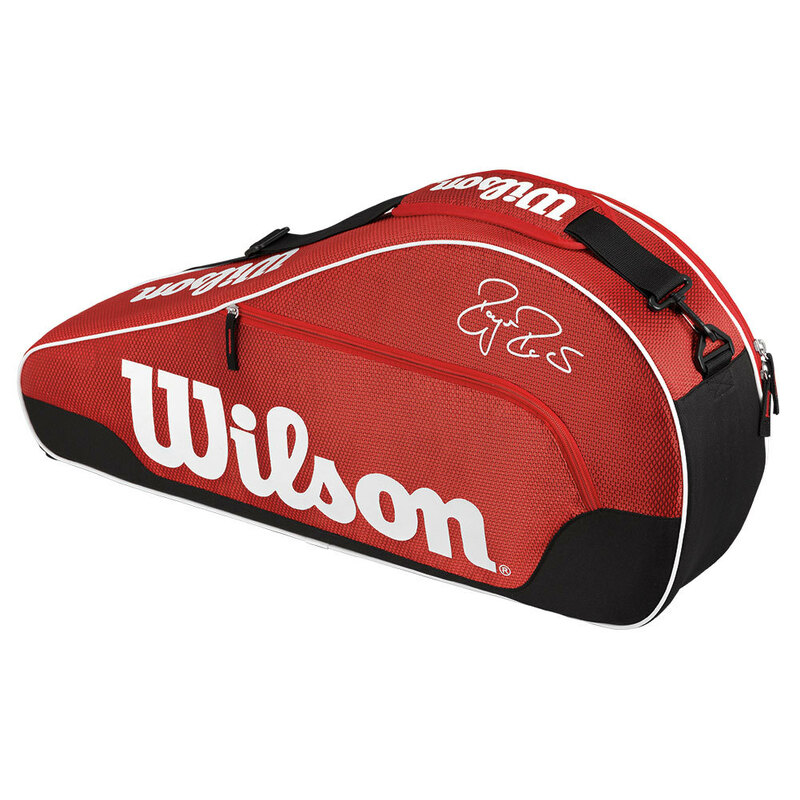 Wilson has designed the Federer Team Bag in a 3 Pack, 6 Pack , or 12 Pack. The 3 Pack Bag can hold 3 frames, but also has a large compartment for holding shoes and clothing. It also features smaller pockets for valuables and a padded strap for easy carrying over your shoulder. If you need more space for your gear, consider the 6 Pack Bag. It has all the same features as a 3 pack bag, but has 2 padded straps. This allows you to carry the extra weight as a backpack, evenly balancing the weight of 6 racquets plus gear. The 12 Pack Bag is made for elite players that are serious about taking gear on court. In addition to the large shoe and clothing compartment, it adds the benefit of a molded plastic frame to allow it to stand on its own. Like the 6 Pack Bag, the padded straps allow it to be carried as a backpack to alleviate the weight of all that gear. Check out our Video Review! 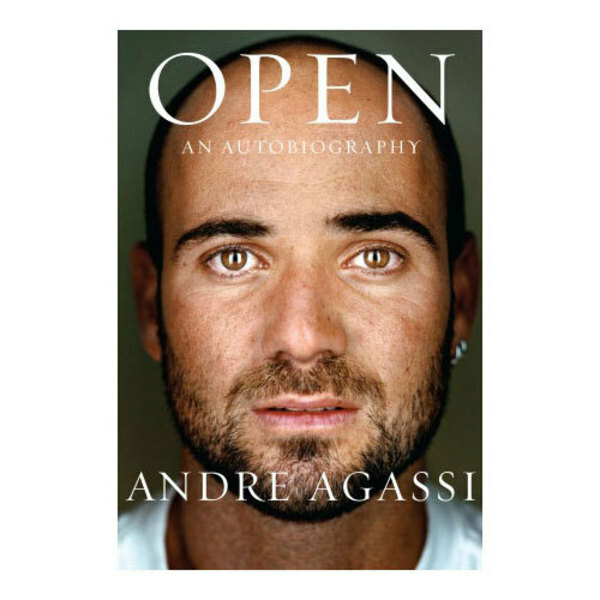 Maybe you’re loyal to your favorite racquet brand? That’s what the best selling racquet company Babolat is depending on. They’ve produced Pure Drive and Pure Aero lines of bags to inspire brand loyalty. 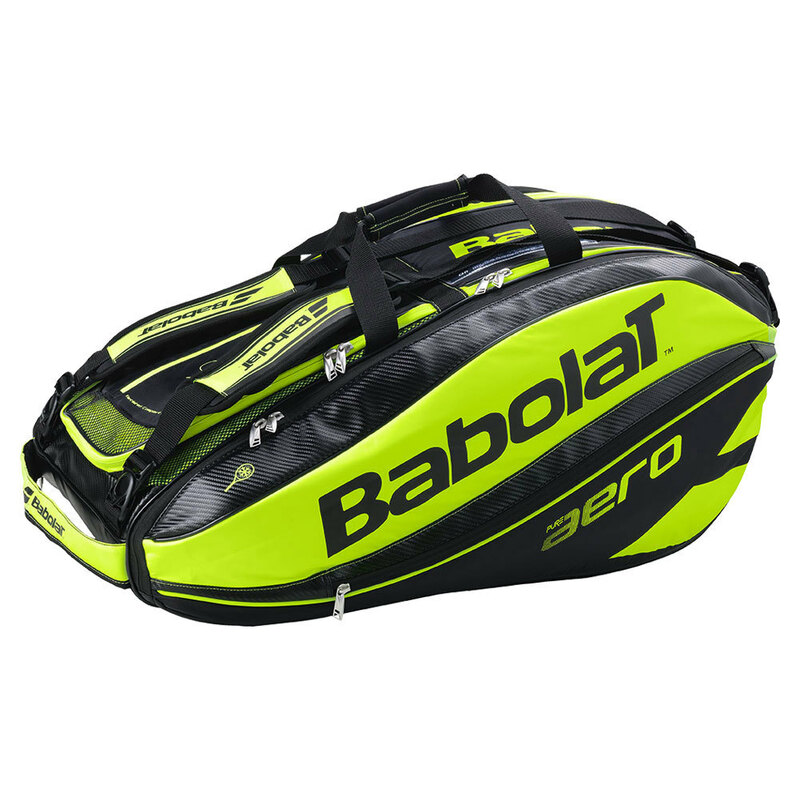 Whether you’ve jumped on board with American players like Jack Sock to embrace the Stars and Stripes Line, or you love the classic Pure Aero style like Rafael Nadal, Babolat has Pure Aero fans covered in style. Babolat bags stand out from the crowd thanks to the Isothermal technology that protects your racquet frames and strings from extreme heat or cold. This helps your string tension remain stable and helps protect your frame from extra wear and tear. If you’re looking for a 3 Pack, 6 Pack, 9 Pack, or 12 Pack, you have options in the Pure Aero or the Pure Drive Line of bags. The 3 Pack and 6 Pack bags offer space for extra gear in a middle compartment, but the 9 and 12 pack bags feature a ventilated, separate space to help keep things clean. Check out our Video Review! Not to be outdone, Head has its own superstar to show off its bags. Novak Djokovic has a choice of bags from his own line of Head bags. If he wants to go big, he can carry the 12 Racquet Monstercombi Bag. It features Climate Control Technology to keep your strings and frames safe from the elements, adjustable padded straps for backpack style carrying, and compartments large enough to carry shoes and clothes. The 9 Racquet Supercombi has all of the same features, but smaller racquet compartments. 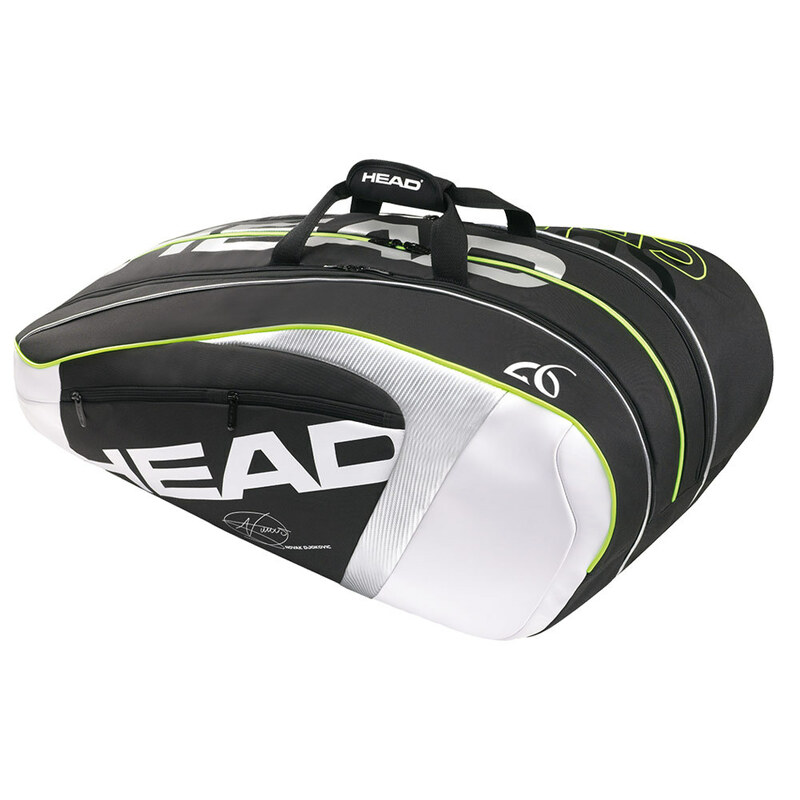 You’ll bring confidence on court with you carrying this bag with Djoker’s signature in full view. Check out our Video Review! At this point, you may be thinking that racquet companies own the market on tennis gear bags. 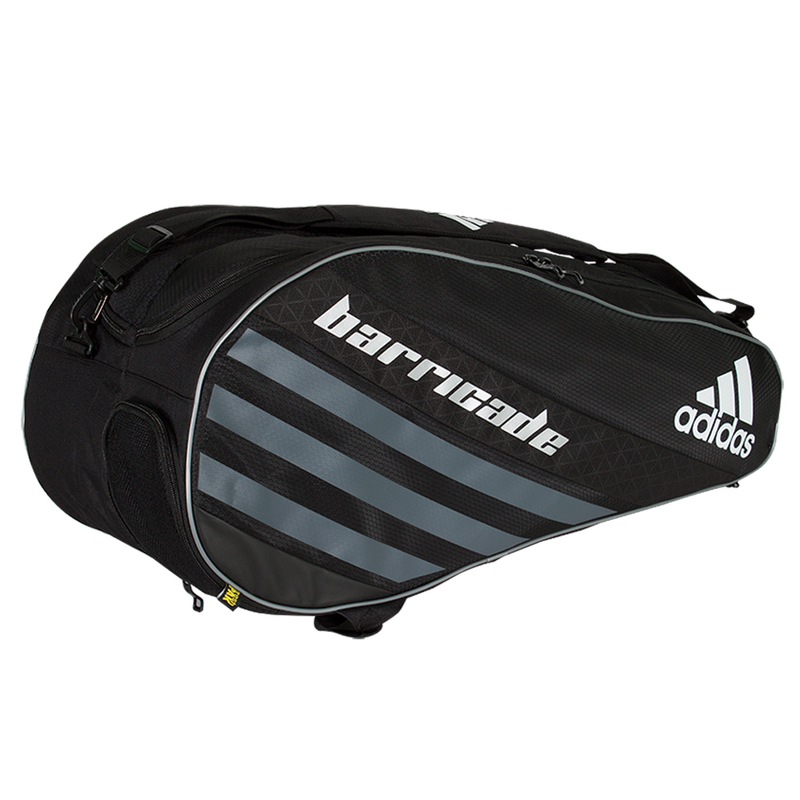 Adidas would like to prove you wrong with the Barricade IV Tour 6 Packet Racquet Bag . It has the same thermal lining to protect your string tension, but adidas knows how important shoes are to elite and recreational players. adidas gives you a completely separate compartment for your shoes. Even better, it has a ventilated accessory pocket with FreshPak technology to keep your items dry and fresh. There’s also a specialized soft pocket for sunglasses and phones, but the best part of this bag is the ventilated wet/dry compartment. My socks definitely need their own space after a long match in the Texas heat. The Barricade also comes in a 3 Pack that doesn’t have the wet/dry compartment, but is an easy size to manage. Both sizes have removable shoulder straps with ample padding for easy carrying. Check out our Video Review! There’s a few more bags that earn an “Honorable Mention” for best tennis bags. The Prince TeXtreme 9 Pack bag features a pouch to keep drinks cool and the Nike Tennis Court Tech 1 Bag even has a stowable shelf inside to help you get organized courtside! Be sure to check out a wide selection of bags before choosing your toolbox! Click Here to See our Video Review!